A time-out is a strategy that involves removing a child from their immediate environment for a short time, as a consequence of a behaviour perceived by the caregiver as a transgression. A majority of parents think putting a child in time-out is an effective way to discipline children and frequently use this practice. Recent research is revealing concerns regarding time-outs, particularly in the absence of other positive parenting strategies, and this document seeks to answer typical questions on that topic. 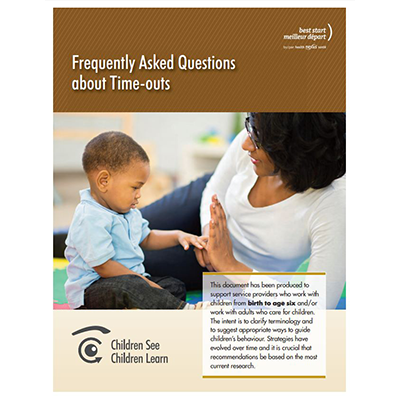 This resource defines and compares the evidence for time-ins and time-outs, and also discusses alternatives to time-out. This document has been produced to support service providers who work with children from birth to age six and/or work with adults who care for children. The intent is to clarify terminology and to suggest appropriate ways to guide children’s behaviour. Strategies have evolved over time and it is crucial that recommendations be based on the most current research. See also the Children See, Children Learn bilingual website.